We Were Woodwards: Somebody turns 5 on February 13th! Somebody turns 5 on February 13th! I remember that cake! I licked the frosting off of those hard candy poodle decorations. 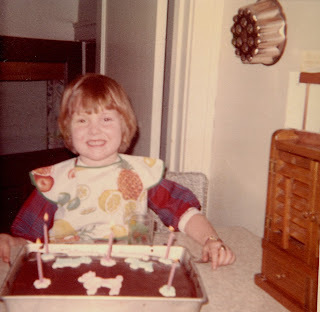 I also remember that bib and that wooden decoration on the table - used to play with it - was it a radio? This was in Feb/1968 - before the Moon landing in July. I don't remember wearing jewelry or a watch at that age - but I am a big jewelry fan now so it's kind of interesting to know I wore jewelry when I was so young. I'm pretty sure my "Prince Valiant" haircut was the result of getting gum in my hair some 6 months earlier but Mom never kept our hair long as toddlers and young children - Janis and I grew longer hair in grade school. The round face, tiny teeth, pink/rosy skin and wide-set eyes are all with me still.